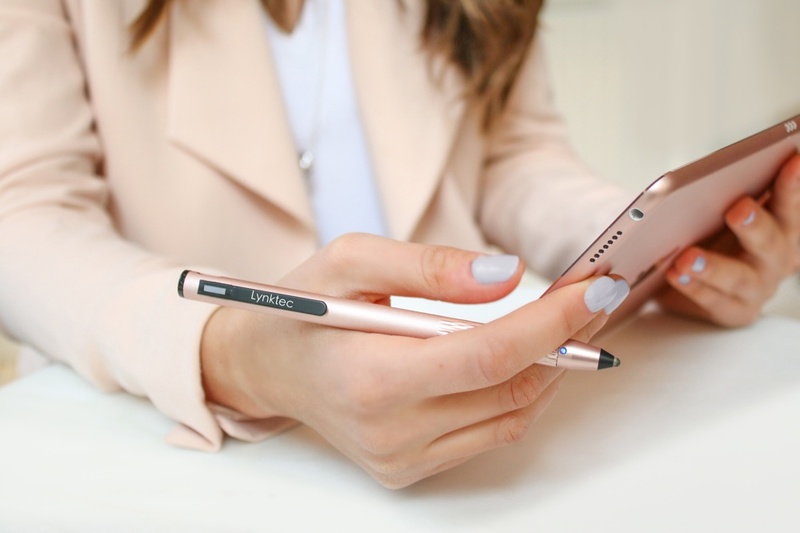 Lynktec has continued to evolve the Apex line of electronic styluses. In late May, the company released a sleek, new version called the Apex Fusion. It's slimmer, better looking, and is available in black, silver, gold and rose gold. It's drop-dead gorgeous and features a fine point for accurate drawing and a rechargeable battery. 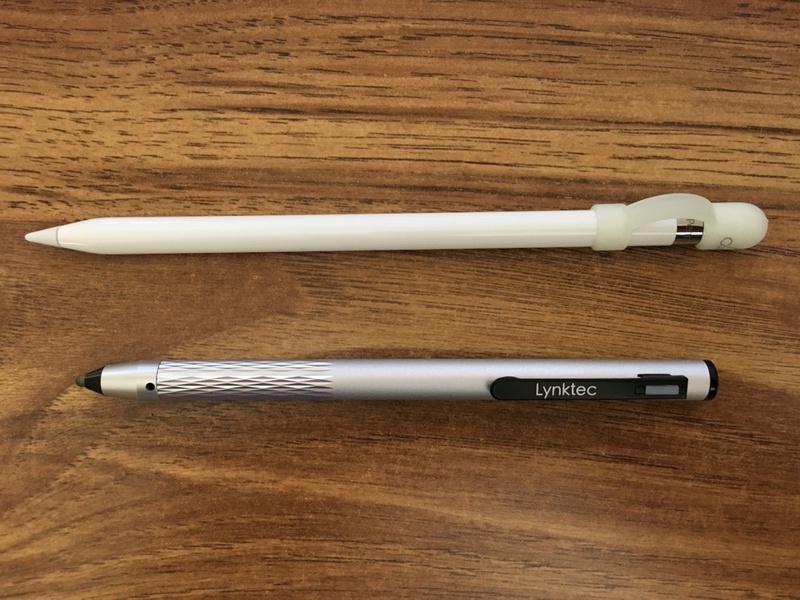 Those who have been following the evolution of Lynktec styluses and my own reviews will recall how the company started out with a fine point, electronic stylus and then steadily improved it. The first, which shipped in early 2014, the TruGlide Apex required an AAAA battery. 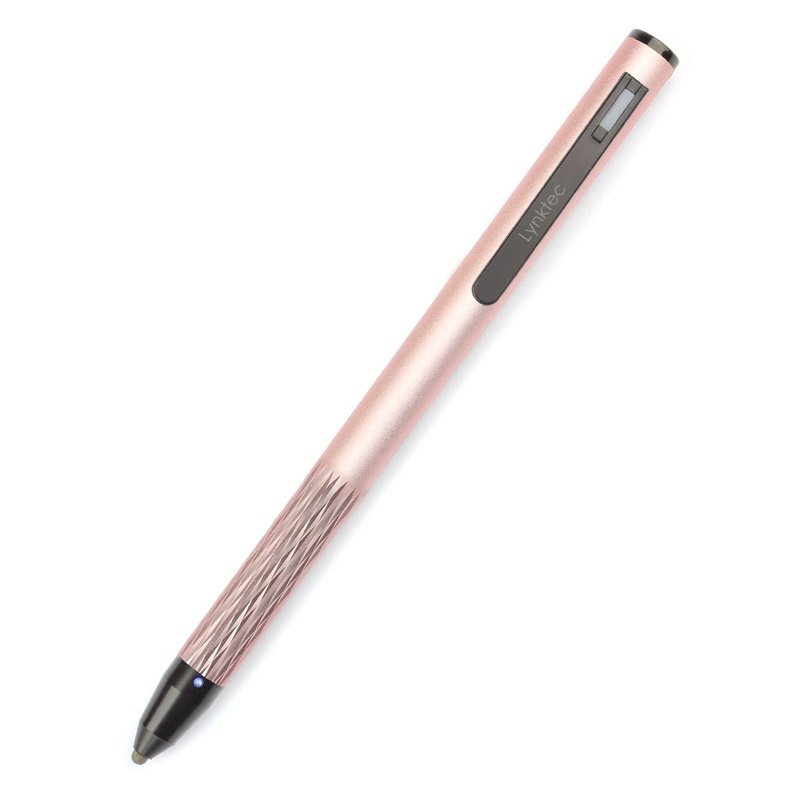 The next version, later in 2014, advanced to a rechargeable battery, the Apex Fine Point Active Stylus. 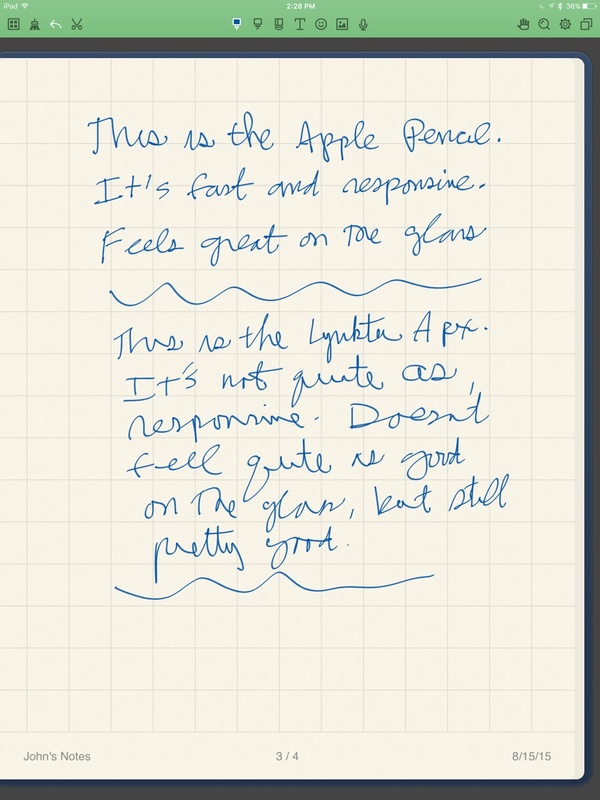 In 2015, Lynktec released the improved Apex Fine Point Stylus that was lighter, featured an improved nib material, and was optimized for the iPad Air 2 (even though it works great with any iOS or even Android device). The latest in this series is the Apex Fusion. It also features the TruGlide tip technology, a smooth gliding polymer fiber tip. Like all before, it works with any iOS and many popular Android devices. What's notable is that it is much slimmer, better looking and comes in four beautiful metallic colors: black, silver, gold and rose gold. The colors are gorgeous and match the modern iPads. For those who may be new to this kind of stylus, I'll provide a brief recap from my previous reviews linked above. ... And now, the stylus technology is changing again. 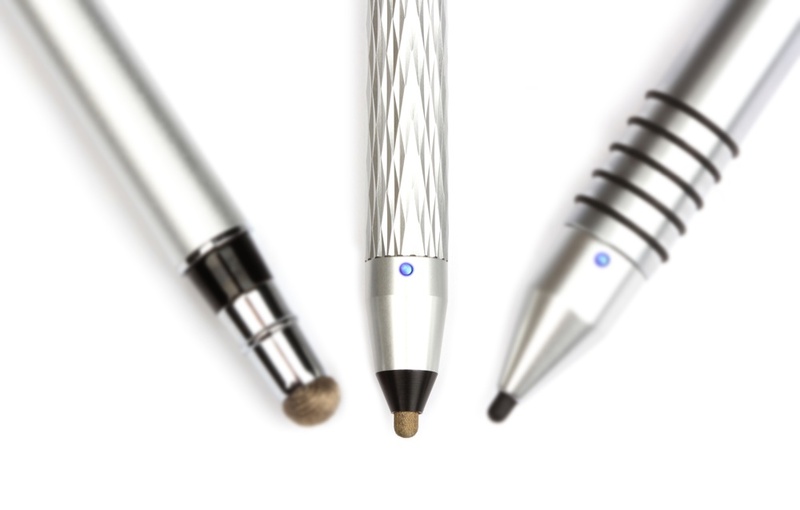 A new breed of electronic styluses has arrived with about a 2 mm diameter nib. This small tip eliminates the mushy feel of a large nib as it drags across the display and lets us better see our drawings and handwritten notes. But there's a problem. The iPad doesn't recognize a nib smaller than 4 mm. The solution? 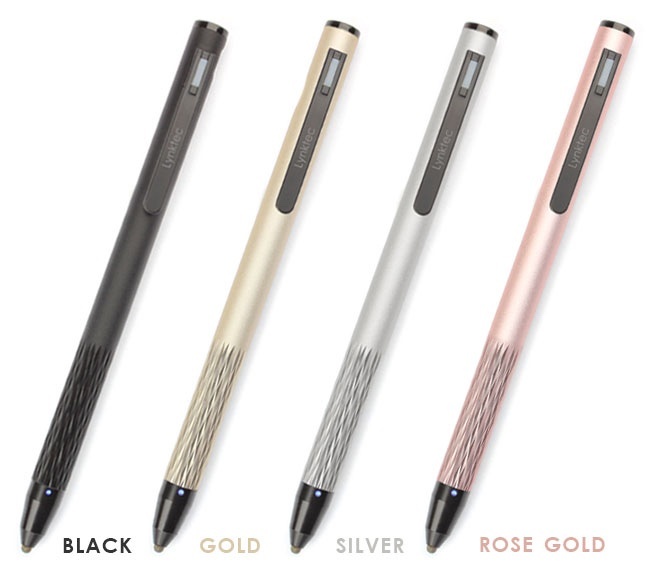 The next generation styluses generate a local electric field at the tip that mimics a larger 4 mm nib when in contact with the capactitive display. To do that, it must have circuitry. And correction logic. And a battery. For the curious, this is not a pressure sensitive stylus. It may seem that the necessity for a powered stylus could be inconvenient, but after you use one with a rechargeable battery it's very hard to go back to an ordinary one with a big, mushy tip. Plus, something else has changed in the industry: The Apple Pencil. The introduction of the Apple Pencil has both legitimized the idea of a sleek electronic stylus and also changed the thinking about iPad cases. These days, it's rare to see a case for an iPad Pro without a clip or loop for the Apple Pencil to store it. And so, if you elect not use the Apple Pencil, most any iPad Pro case will allow you to also keep this Apex stylus handy. Another influence from the Apple Pencil is its diameter. Apple set a new standard for how a stylus should feel in the hand and be balanced. That dictates a length, diameter, weight and weight distribution. The Apex Fusion is a sleek, sophisticated alternative to the Apple Pencil with the main differentiators being that it is more affordable at $59.99 and that it is compatible with all iOS devices as opposed to just the iPad Pro. So far, I've covered the operation of an electronic stylus and the overall design and color scheme of the Apex Fusion. Here are the detailed specifications. Length: 15 cm (5.9 inches). Diameter: 1 cm (0.4 inch). Weight: 14.6 grams (0.52 ounces). Lithium ion battery life: 14 hours of average use. Number of battery cycles: at least 500. Nib diameter: About 2 mm. Auto turn off: 30 minutes. Available colors: black, silver (shown here), gold and rose gold. I asked Lynktec about the previous practice of including an extra nib. The way our new nib is constructed with the TruGlide conductive fiber has made it much more durable so it will last much longer than the original nib—we expect our average user to get at least six or more months per nib, and some may find it to last for a year or more. With that in mind, and the extra cost of these new TruGlide nibs, we decided not to waste extras that can be easily lost by including them in the original packaging. We are making them available online at our Lynktec store at $4.95 each. Page 2: Recommended drawing apps, testing against Apple Pencil, fInal words. I've been using this stylus daily for several weeks now, and I can report that it's now my favorite stylus for all-around use. The feel, the weighting, the diameter, and the colors are amazing. While about an inch (2.5 cm) shorter than the Apple Pencil, it feels just as good, just as well weighted and just as grippy in the hand. In all other respects, I found this stylus to be delightful. I kept it in the loop of the OtterBox Hybrid case that I used during testing, so it was always handy. I never ran the battery down all the way, and just occasionally connected it to the microUSB cable on my desk while I was writing on my Mac. It's easy to do that because there's no cap to unscrew, and the port is modest in size. It doesn't affect the aesthetics of the stylus. Of course, this stylus doesn't have the advanced features of the Apple Pencil, but if you're looking for an all-around stylus to use with all your devices—or you don't have an iPad Pro—you will want this stylus. It's the best I've ever used. Lynktec continues to improve the Apex series, and the company does it often. The design, the operation, the feel and the price are all well matched. Plus, I have to say, it's the most beautiful stylus I've ever used. It feels good in the hand and that polymer fiber tip feels super smooth on the iPad's glass. For everyday operation on any iPad or iPhone, it's a great choice. The very best yet.